Indian Super League title holders Chennaiyin FC today signed goalkeepers Sanjiban Ghosh and Nikhil Bernard on a two-year and one-year deal respectively. CHENNAI: Indian Super League title holders Chennaiyin FC today signed goalkeepers Sanjiban Ghosh and Nikhil Bernard on a two-year and one-year deal respectively. 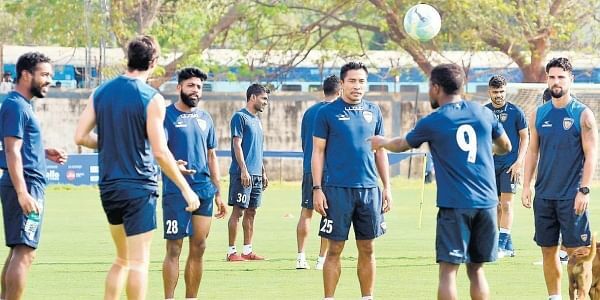 26-year old Ghosh joins on a free transfer after spending the 2017-18 season with Jamshedpur FC while 28-year old Bernard moves to the two-time ISL champions following expiry of his contract at I-League outfit Gokulam Kerala FC, said a press note. The two join the experienced Karanjit Singh, who had signed a two-year contract in July 2017. "Joining the ISL champions is a huge achievement for me. I'm eagerly looking forward to joining the squad in pre-season and help the club retain the title," said Ghosh, who deputised for Subrata Paul at Jamshedpur FC last season, making one appearance in the ISL. Bernard too is relishing the challenge and said, "I am very happy to join Chennaiyin FC. They are a fantastic club with a brilliant coach and management. I am really excited for this next chapter in my career.
" Head coach John Gregory welcomed the arrivals, reiterating the importance of competition for places in the squad. "Sanjiban and Nikhil are solid custodians with very good potential and attitude. It is going to be the biggest season in the club's history as we are also going to be involved in the AFC Cup so healthy competition is required in each position including the goalkeeping department. I look forward to working with them," Gregory said. Ghosh recently received a call-up to the 30-man preliminary India squad for the four-nation Intercontinental Cup currently underway in Mumbai. The Bengal shot-stopper started his career with local Kolkata club Southern Samity before playing in the I-League for Mumbai FC. In the ISL he was part of the Delhi Dynamos squad that reached the playoffs in the second and third editions.